We slept surprisingly well for being packed like sardines in the dorm. We were strategic in our choice of pads which ended up playing to our favor with an empty pad on either side of us. The day before, upon paying for our accommodations we had to choose a breakfast time – 6, 6:30 or 7 am. The dorm had to be empty by 7:30 so we opted for a 6:30 breakfast. After hearing the weather forecast we entertained the idea of delaying breakfast to wait out the morning rain and clouds but at 7:30 they had cleared out the dining hall as well. The people who maintain the huts work incredibly hard to accomdate the 20 – 50 hikers they feed and house each night. We will admit we were a little disappointed in the lack of hospitality of this hut. Granted we have only been to 2 but the schedule seemed a little strict and detracted from the “homey” feel. 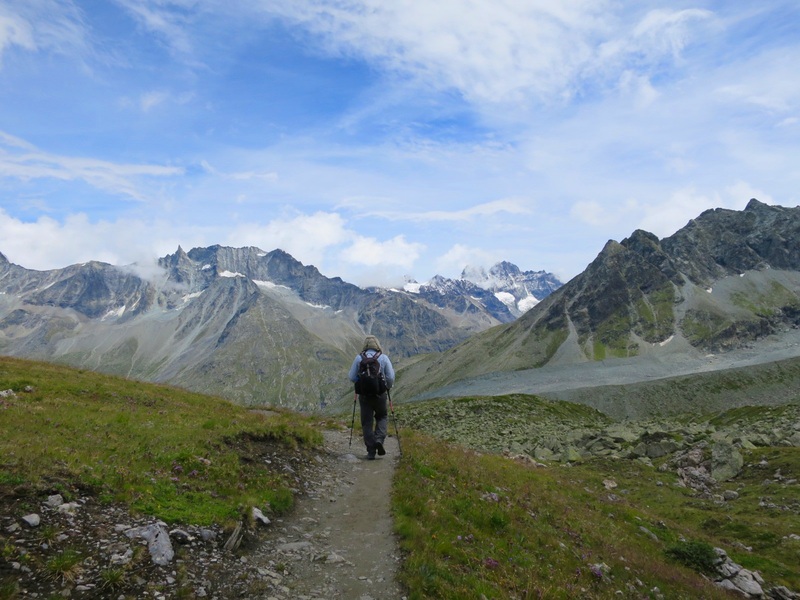 By 7:45 we joined the mass of hikers making their way up the trail to Col Des Roux. It was a short 30 minute hike up to the pass. At the top we were treated to more gray clouds and the long Lac Des Dix. We were both grateful to see a trail winding its way down the grassy hillside. “A trail! A real trail!” exclaimed Andy with delight. It occurred to Laurie that our hike is aptly named the “Haute Route” as thus far it has been more of a route than a trail. We glided down the trail, admiring the waterfalls pouring into the lake below and the wildflowers that lined the trail. 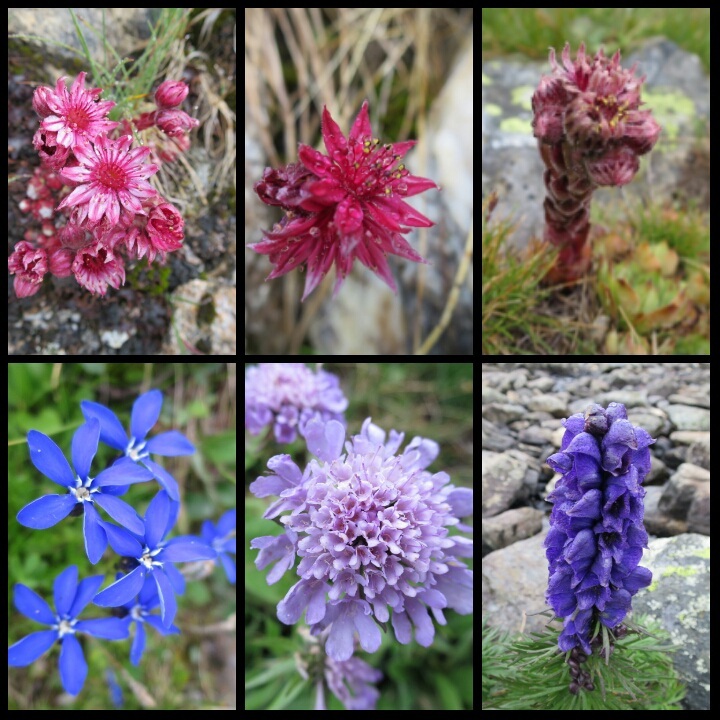 While the clouds continued to obscure the views, the flowers and small plants got much more of our attention and appreciation. We stopped by the Refuge De La Gentiane La Barma which is an old cheese dairy and cow farm turned refuge. Hikers can stay here but must be self suffient as there is no food or bedding available. It was another 45 min walk to the end of the lake. We passed grazing cows on the hillsides and many on the road. The sound of their jingling cow bells filled the air providing what Andy referred to as the soundtrack of the Swiss Alps. From here we began our climb toward Col de Riedmatten. It started out steeply as many small, deep and narrow paths wound their way up the green hillside. 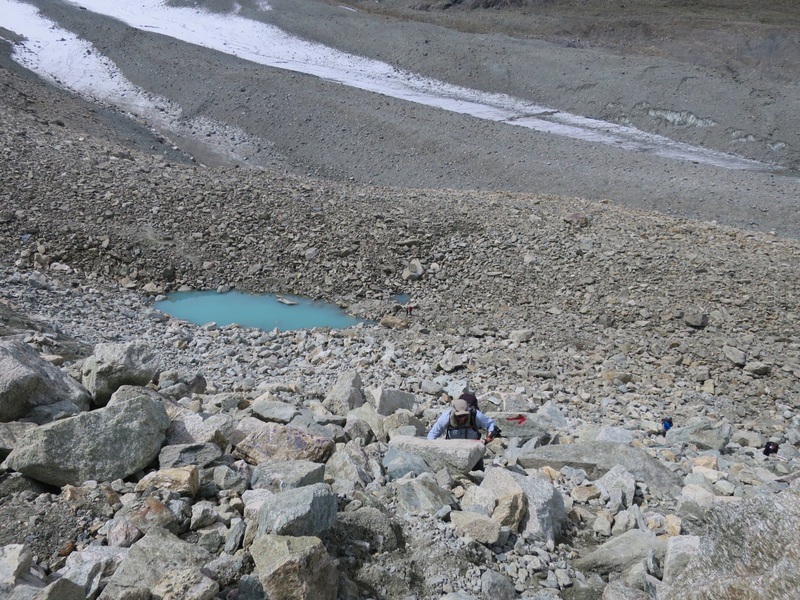 We made our way slowly and steadily up toward the glacial moraine of Chelion glacier. We stopped a few times to make sure we were on the correct track since there were trails below us and nobody in sight. Eventually we reached the junction for the Cabane Des Dix. Here we verged off to the left and crossed a glacier melt river cascading down through the gorge. We picked our way across fields of shale, medium sized boulders and trail. We walked to the base of the Chelion glacier and took a lengthy break in hopes that Mont Blanc de Chelion would fully emerge from the clouds. It didn’t. So after 20 minutes we set off again. The trail came to a few more junctions before climbing steeply towards the Col. Here again, there was no trail but a boulder field with red and white painted blazes marking the route. Luckily there was no snow to contend with so the going was easier and faster. This portion of the trail is a ‘choose your adventure’ type of scenario. 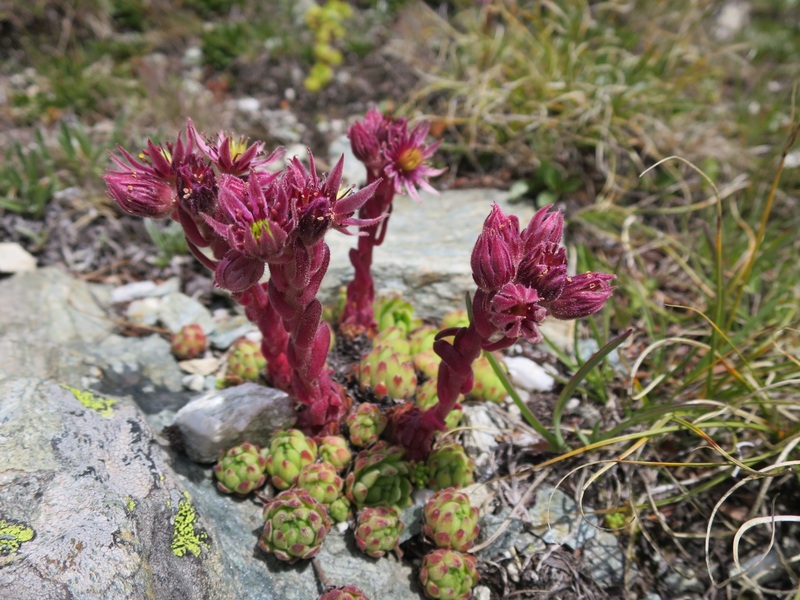 One can continue to scramble up loose rocks and boulders toward the Col de Riedmatten or climb a series of 4 ladders to Pas de Chevres. We opted for the ladders. Laurie admitted to being scared on the second ladder and Andy understood why when he got there. When climbing up the first ladder you can’t see below you. But you can on the second one, and it’s a loooong way down. It is amazing how powerful our brains are. It almost seems that you can do whatever you put your mind to, even scaring yourself silly even though you’re perfectly safe. Once we reached the top of the 4th ladder, we took a few steps and our jaws dropped. 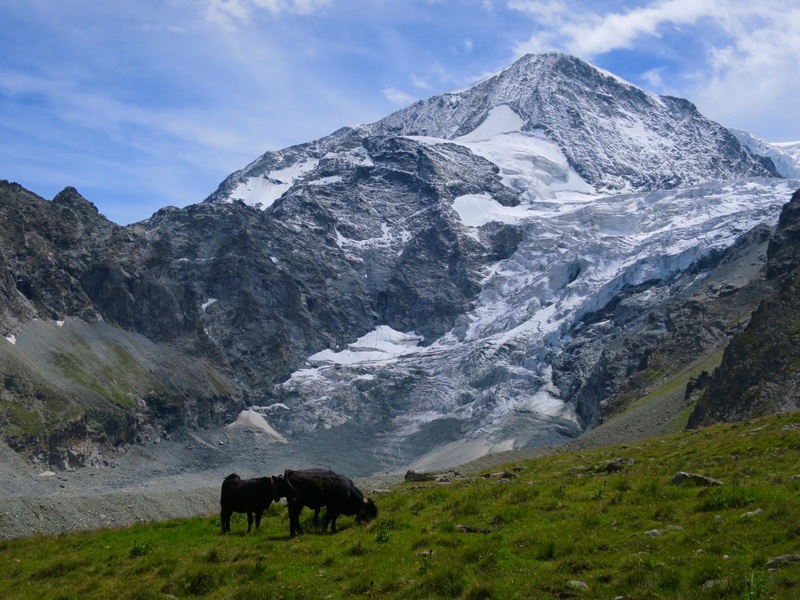 The Matterhorn and many others were in view, including a few glaciers. Finally, our hard work had payed off. Yes, hiking and physically challenging ourselves is a reward in and of itself but we do hike for the views too. It’s an excellent reward and a great motivator. Hiking day after day in inclement weather knowing what we are not seeing can be demoralizing, especially if the trail is challenging. But right now, in this place and time, we had sunshine and views of grand mountains. We climbed even higher off trail and found a nice place to just stare at our new horizon and snack. After about 30 minutes we set off yet again down the trail – and yes, on this side of the mountain we had a nice, soft 18 foot wide dirt path to walk on. Lovely! At a junction we chose to take the road down to town to save our knees but sonnafter the road ended and we were reunited with the trail. 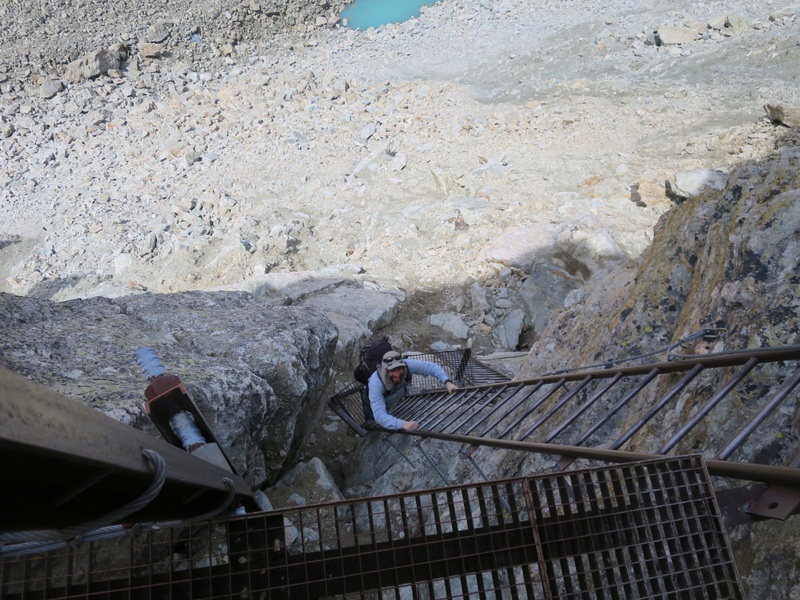 As we predicted the trail got steeper as it switchbacked into town, descending at least 1,500 feet to Arolla. 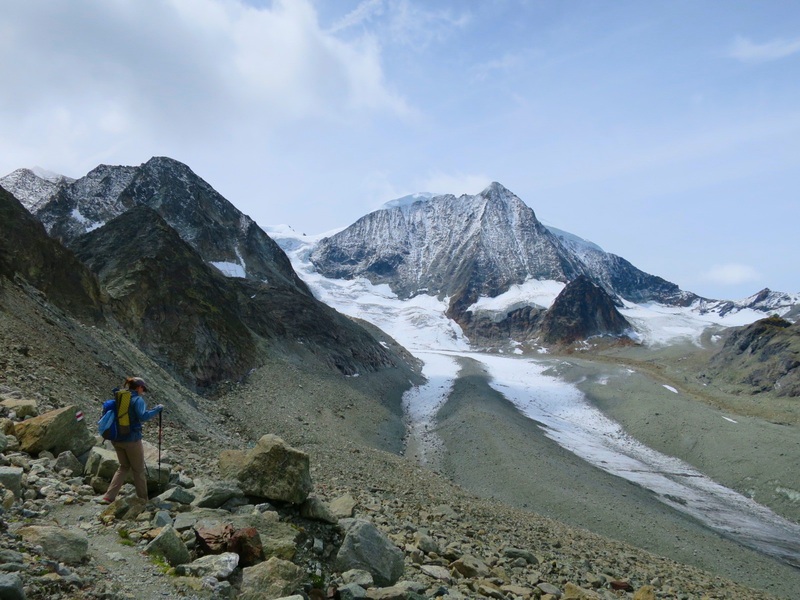 As we descended, we distracted ourselves with conversation and views of Pigne d’Arolla mountain and Tsijiore Nouve glacier. We also realized that we were descending into trees. We haven’t hiked among trees since we picked up the trail outside Verbier! 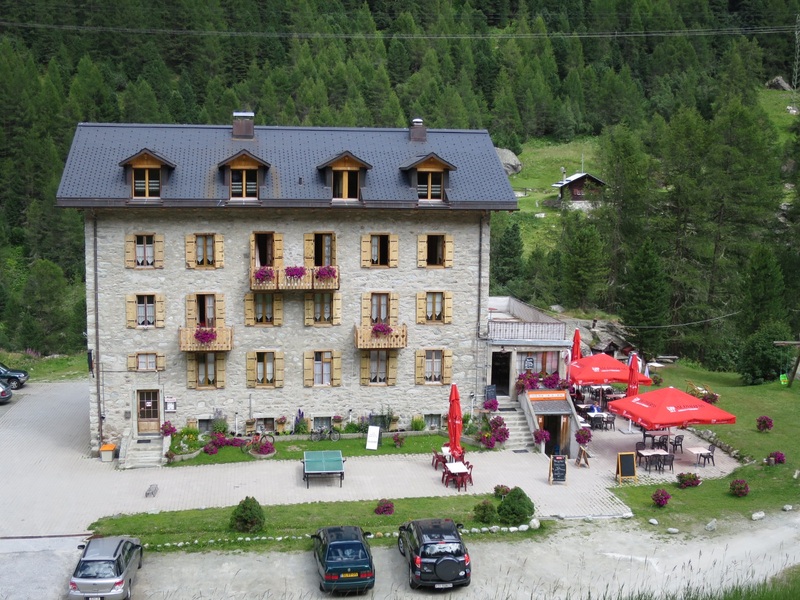 Once in the cute town of Arolla we caught up with an English couple we’ve shared dinner with the last 2 nights. They are leaving the trail today and it was nice to say goodbye. Laurie noticed a shop selling ice cream and lit up like a beam. We walked through town, Laurie happily licking her ice cream and both of us admiring all the brightly colored flower boxes on the balconies of all the rooms of the hotels. After two more miles of descending the trail paralleling the road we made it the Hotel De La Tza, our home for the night. It was 3:53pm and we were told that we couldn’t check in until 4pm. “Very Swiss of them” Andy mumbled with a smile, only half irritated. Truth be told he had to poo and didn’t want to wait. Once we checked in, Andy made a beeline for the bathroom. We then showered, our first in 3 days. We worked on the blog and before we knew it, it was time for dinner. Unfortunately something we ate didn’t agree with Andy’s stomach. He went to bed around 8pm and almost immediately fell asleep. Laurie blogged and spoke with her mom until she too felt her eyes closing. It didn’t take long to fall asleep in our comfy beds. Tonight we are grateful for hot showers and sunny mountain vistas. Wait and you shall be rewarded. 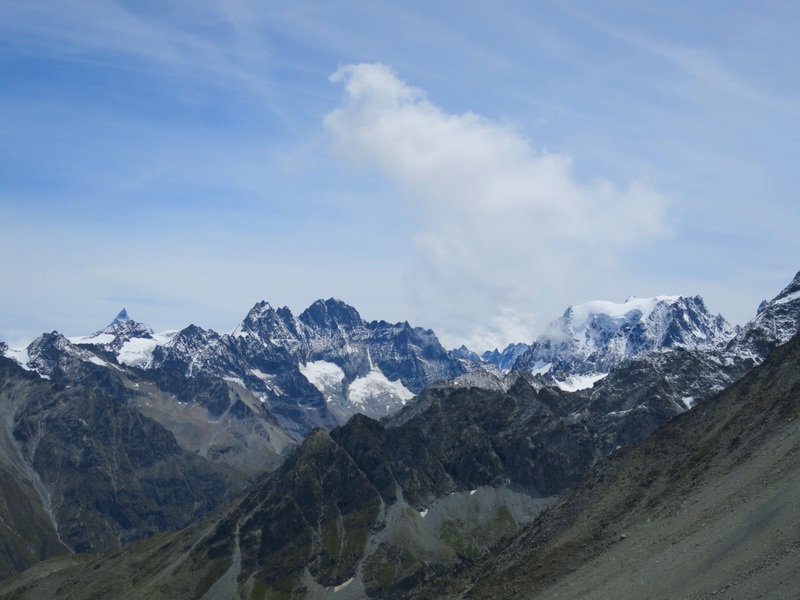 Mont Blanc de Cheilon and Glacier de Cheilon finally revealed themselves. We finally got proper views of mountains! Can you see the Matterhorn? Those ladders!! So scary. It looks like they’ve changed since 2011. 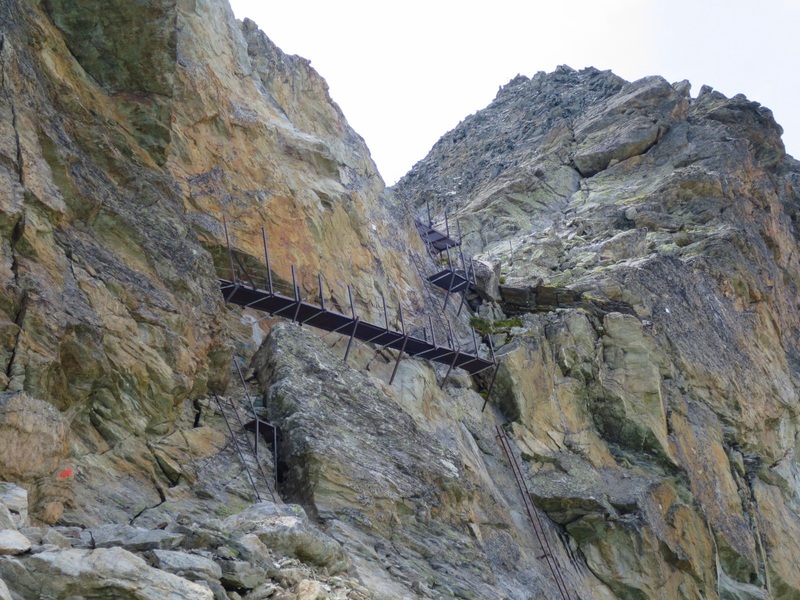 When we hiked there were no platforms- just two really long wobbly ladders. We’ve heard of those ladders from other hikers. We have it easy! And..we’ve been thinking about you two a lot on this trip.